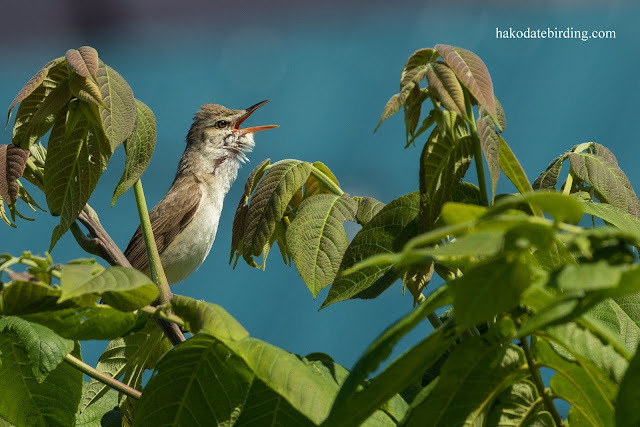 An Oriental Reed Warbler singing from the bushes near my apartment this afternoon. A warm midsummers day....................the quiet time is here as the local birds are now generally busy feeding young and all the action occurs deep in the bushes/greenery. Oh England...............please don't play like that again after I get up at 4am to watch. The Oriental Reed Warbler looks somewhat bigger than ours, or is it an illusion? As for England, stay in bed and watch the highlights later. That's if there are any highlights!! It's very similar to the Great Reed Warbler of NW Europe, not the smaller ones at Leighton Moss and the like. The worst thing about not beating Slovakia is that next up I don't get a beer fuelled game on a Saturday night but instead another 4am game on a Tuesday morning. I get up at 4:00 to go birding. Sounds like it's a tad more entertaining. It would have been on this occasion, even in the rain. Hello Stuart! :) That's a great shot of the Warbler. :) I get to see the young fledglings being fed at the garden feeders, but the photos are not nearly as nice as when the birds are seen in the trees. The football has been disappointing,...my friend who came over for a visit gave up watching after the first few matches. If you think that was bad wait until they play Iceland. We'll all have our fingers crossed at zero christ hundred tomorrow ~ but I'm really concerned England will stuff this up.